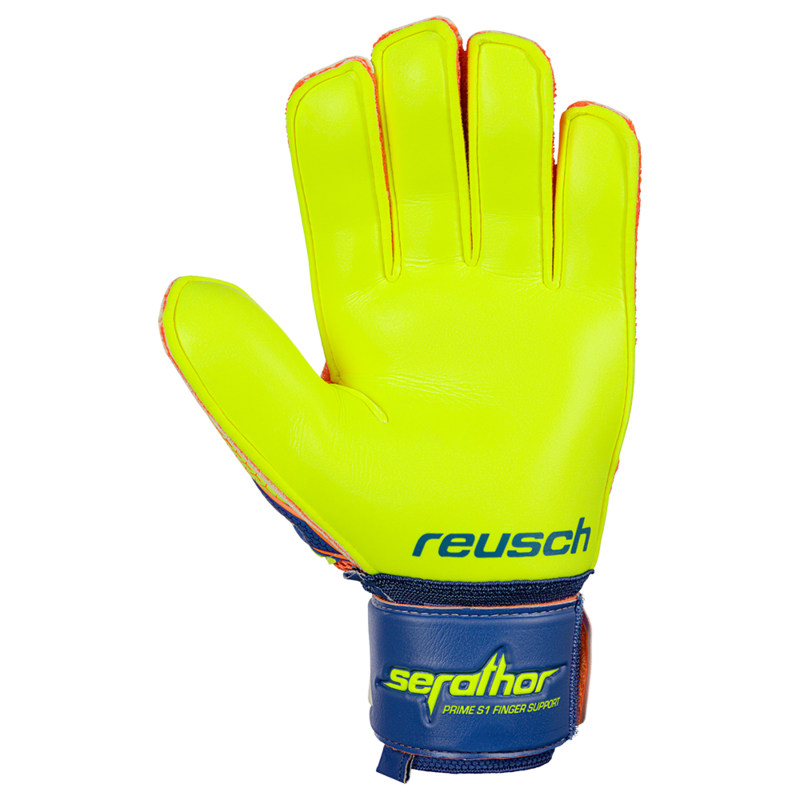 Reusch Serathor Prime replaces the Pulse S1 finger support. Finger and thumb spines for the soccer goalie on a budget. Now on sale. 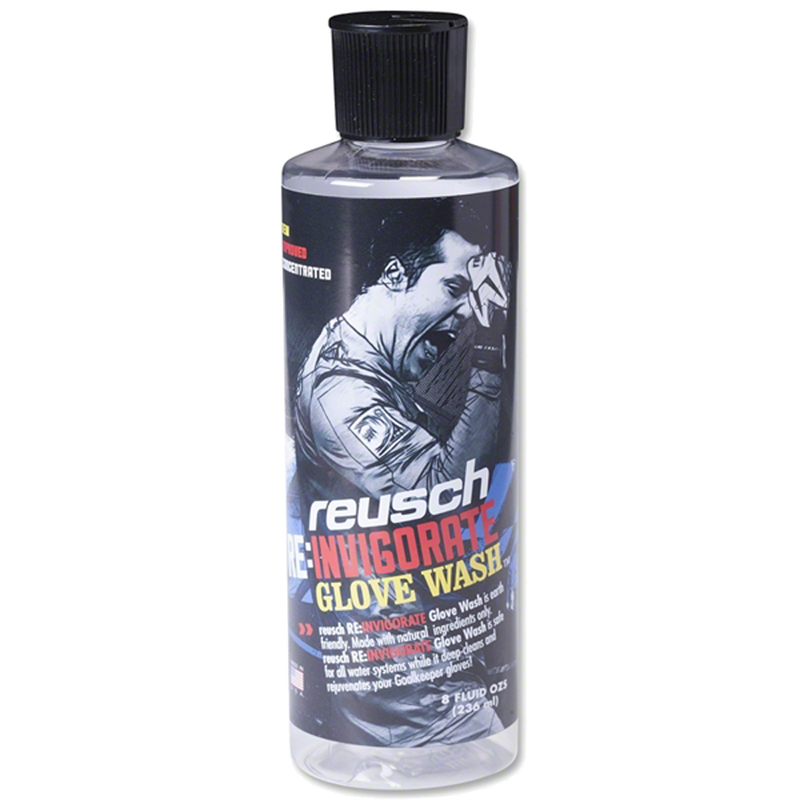 Reusch's German made S1 Super Soft Grip foam is a high quality palm made of all natural latex. It offers excellent gripping properties while still maintaining durability. Better grip the Reusch's SG latex. Step down from the G2 or M1 latex. Palm is a bright safety yellow. Deep thumb notch on the face of the glove includes an elasticized thread to help eliminate tear outs. Yes, the Reusch Finger Support stays are flexible spines that span the length of the fingers and thumb to prevent hyperextension. They are not as rigid as the Ortho-Tec system. Perfect for the goalkeeper who wants some protection, but still have some flexibility. Benefit for soccer goalies is lower price and more flexibility. Super Soft latex backing material. Embossed foam design makes the glove more flexible at many breakpoints. AirVentSystem uses highly breathable Air Mesh material to make the Reusch goalkeeper glove more comfortable. Shocking orange, bright yellow, deep blue, and white backhand. 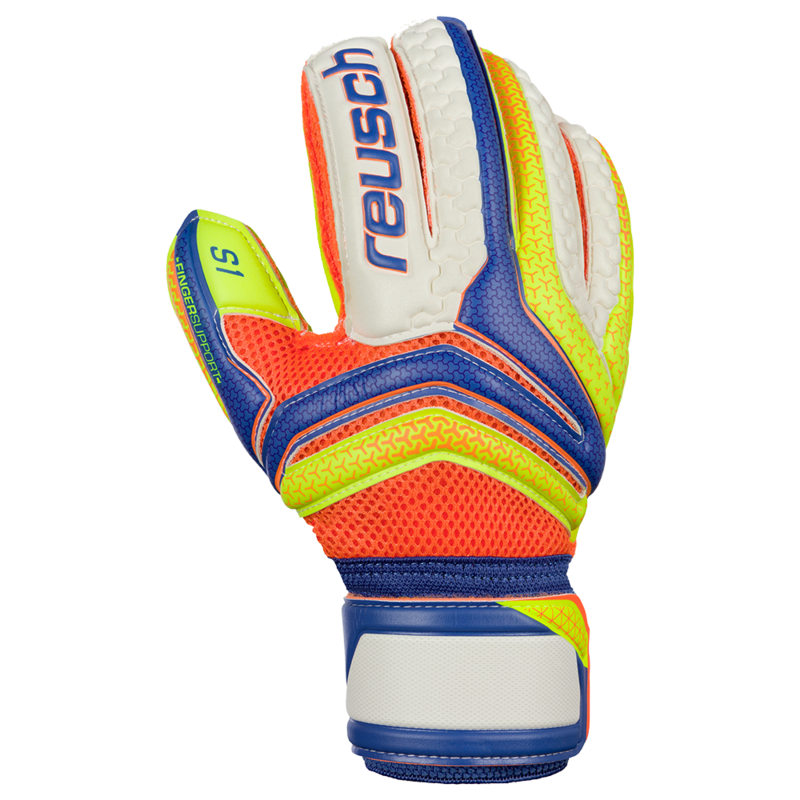 Reusch's Expanse Cut Ergonomic Support System, ESS, uses a pattern that helps the fingers to be pre splayed, which helps adult goalkeepers catch the ball using the correct technique. This is also the cut of the Serathor G2 and Waorani Ortho Tecs. 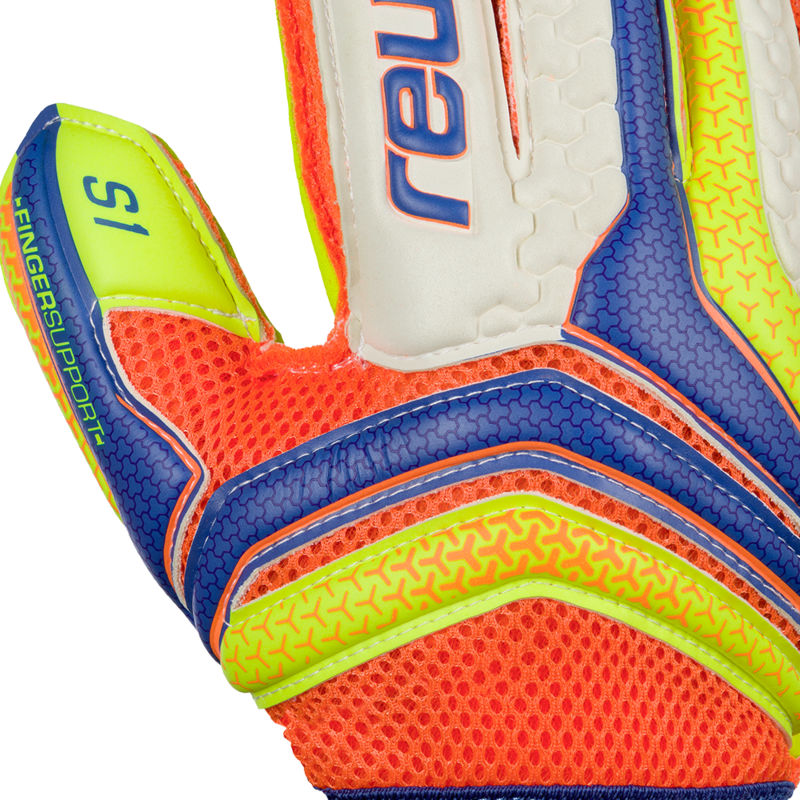 This glove also features Reusch's Thumbflex technology for extra comfort and support. A great practice or game option for any goalkeeper needing finger and thumb spine on a budget. Many keepers will use Reusch S1 or SG for practice if they have the G2 as a game pair. 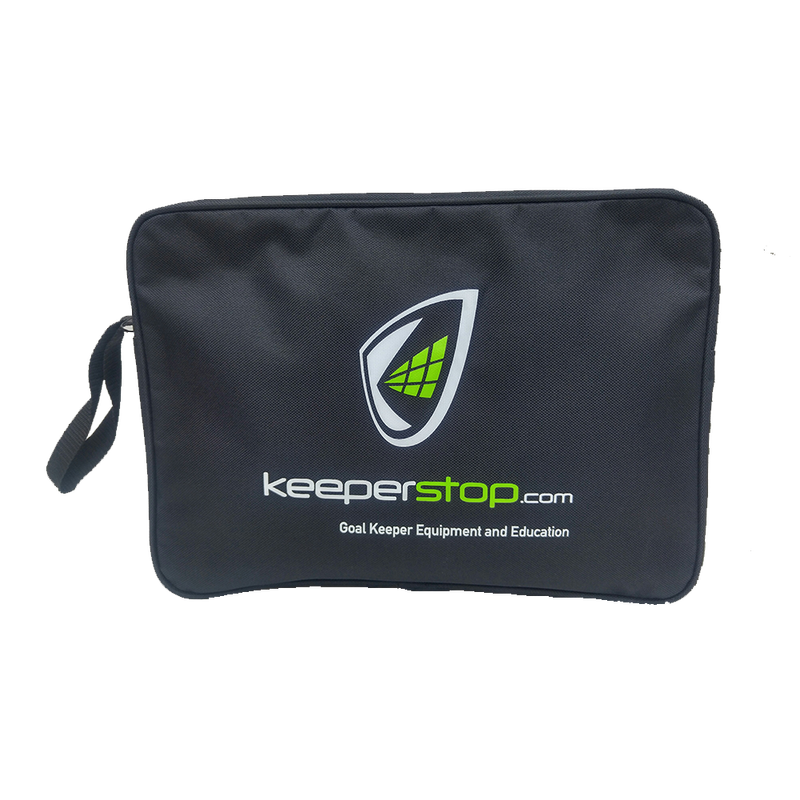 Popular choice for high school or adult keepers due to a good balance of grip and durabulity. Can be used in practice or games. 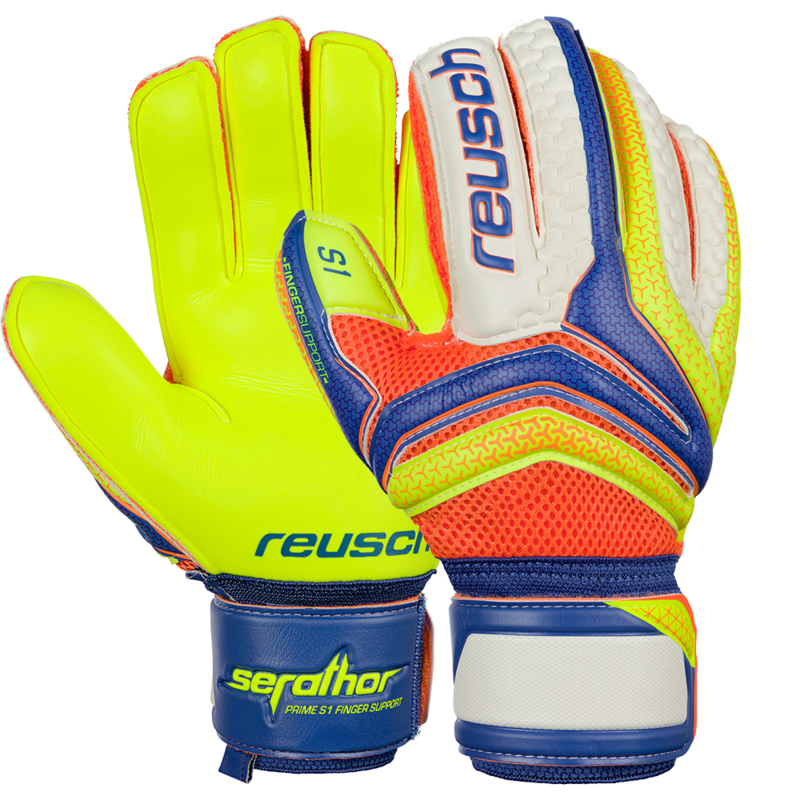 New Reusch Serathor design. Great color combination with a bright yellow palm. Available in adult goalkeeper gloves sizes 7, 8, 9, 10, and 11. Fits true to size. Excellent gloves and even better customer service!